Red malayalam movie directed by Vasudev Sanal will have Asif Ali, Sreenivasan, Lal, Manikuttan, Vijyakumar, Nandu, Nobi, Sudheer Karamana, Jaffer Idukki, Prasanth Alexander, Lena, Mythili, Vishnu Priya and Lakshmi Priya donning important roles. Produced by Aji Medayil, Joy Kaithamattom and Christy Kaithamattom under the banner Good Company & Angel Works, the shooting of the movie is progressing in Ernakulam. 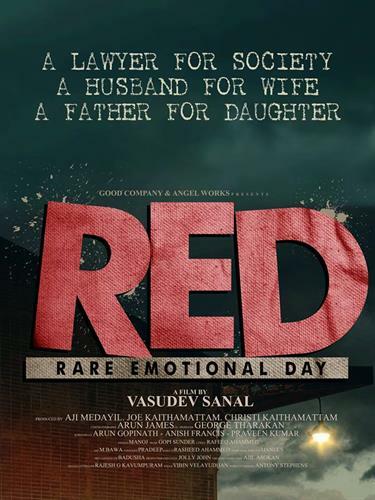 After the majestic success of Salt & Pepper, Lal, Asif Ali and Mythili are coming together for Vasudev Sanal's 'Red'. Vasudev Sanal who made his directorial debut with 'Priyam' is back in business with 'Red', which tells some events which took place in the life of few people in a day. Sreenivasan, Manikuttan, Vijyakumar, Nandu, Nobi, Sudheer Karamana, Jaffer Idukki, Prasanth Alexander, Lena, Vishnu Priya and Lakshmi Priya will give life to to other characters in the movie. Produced by Aji Medayil, Joy Kaithamattom and Christy Kaithamattom under the banner Good Company & Angel Works, the pooja of the movie was held recently. As per plans, the shooting of the movie will be finished in two schedules. The script work is safe in the hands of Arun Gopinath, Anish Fransis and Praveen Kumar. For the lyrics of Rafeeq Ahmed, the music is composed by Gopi Sunder. Arun James would zoom the camera for the movie which started rolling in Ernakulam. The movie which comes under the genre 'thriller' was earler titled as 'M3', which focuses upon various complexities of human life. M3 stands for Man, Money and Mystery. With Ernakulam being the hub of film making in malayalam, most of the film makers wish to shoot at locations near to the city. It is known that a number of movies are currently under shooting process which is being taken place at various locations in Kochi. Asif Ali who has completed 'Honey Bee' will also be seen in Driver on Duty' directed by Manoj Palodan. This would be the comeback movie of south indian actress Remya Krishna while Mythil is having a bright year with movies like Nadodimannan, Ente Sathyanweshana Pareekshakal, Bhoomiyude Avakashikal and Kathaveedu.